A gift from the artist to Clara Klinghoffer in 1939. J.W.F. Stoppelham; Christie's, London, 13 November 1964, lot 100. Anonymous sale; Christie's, London, 14 July 1967, lot 109. Anonymous sale; Christie's, London, 12 June 1970, lot 85. Purchased by the present owner at the 1977 exhibition. Sketchbook 63, Pissarro Family Archive, Ashmolean Museum, Oxford, inscribed 'From Curtle Way Hill'. Letter from Lucien to Esther Pissarro, Pissarro Family Archive, Ashmolean Museum, Oxford, 29 January 1918. A. Thorold, A Catalogue of the Oil Paintings of Lucien Pissarro, London, 1983, pp. 134-5, no. 273, illustrated. London, New English Art Club, Summer Exhibition, 1918, no. 47. 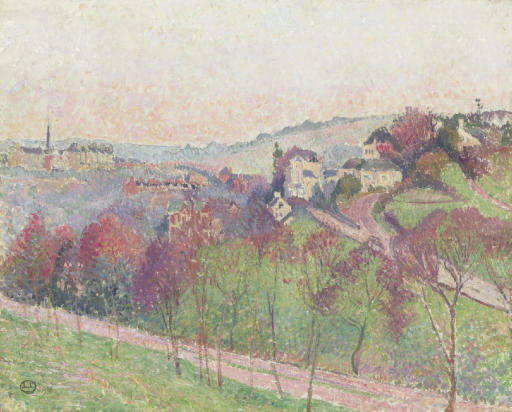 London, Hampstead Art Gallery, Paintings and Drawings by Lucien Pissarro, October - November 1920, no. 36. London, Anthony d'Offay, Lucien Pissarro, November - December 1977, no. 34. London, Browse & Darby, British Paintings 1880-1960, March - April 1982, no. 26, as 'Landscape near Hastings'.